1. Do you have a proven track record of service commitment? The best way to evaluate a prospective service provider is to examine their service track record from multiple perspectives. Find out about their customer service and get to know if their service has followed an upward trajectory. Ask the provider’s existing customers if they were happy with the service provided. Be sure to ask the vendor if they offer help desk support after the completion of the project. You must also find out if the provider’s SLA (Service Level Agreement) is backed by financial guarantees and follows customer service standards and operational metrics. 2. How do you plan to manage my account? Finding out how your business account will be managed is a critical aspect of the outsourcing project. Ask the service provider if they follow a clearly defined account management process. Find out if a dedicated individual will be handling your day–to–day functions and how frequently you would need to interact with that person. Ask the vendor if you can meet your future account manager and other staff before the onset of the outsourcing project. 3.	Who are your previous customers and how satisfied are they? Request the service provider to provide you with their customer list of former and existing customers. Speak to at least five of these customers who have a similar industry profile/business needs as yours. Ask them for detailed and honest feedback about the provider’s strengths and weaknesses. Find out if they faced any problems and how they were resolved. Finally ask them how satisfied they were with the provider’s service levels and systems management expertise. 4. What is the level of quality that I can expect from your personnel and infrastructure? Find out how reliable and scalable a provider is by asking information about their infrastructure, technology partners, internet providers, data centers, network environment and key metrics followed. Making an on–site visit to the vendor can give you confidence in the provider’s management expertise and physical infrastructure. Also ask details about the provider’s quality assurance methodologies, procedures and processes. 5. What are the security measures that you have in place? Security is something that you must find out about as you will be sharing confidential business information with the provider. Ask the service provider for a detailed description of how they have protected their facility from outside intrusion. Find out about the firewall and other security measures taken by the provider. Ask the vendor if they have a recovery plan in case of a security breach. Finally, ensure if the provider’s data center is staffed with qualified, experienced and committed resources. 6. Do you offer a migration plan? Find out if the service provider has a tested plan to ensure a seamless migration of operations and data from your company to their business center. Get to know in–depth details of how the vendor will be governing the migration and the methodology that would be employed. Ask the vendor if their migration plan can be modified to meet your needs/concerns. Also check if the provider will work with your in–house staff or overlap operations to ensure a smooth transition. 7. How are your services priced? Before starting on the outsourcing project, make sure you know what you are paying for. Query the prospective provider to find out about hidden costs. Ask if you will be priced separately for helpdesk services. Question the vendor about how their pricing will change as your needs scale up or down over time. Ask if you can expect pricing breaks or waived fees in case the vendor misses a specified service level commitment. Weigh the final pricing structure against your total cost of ownership (TCO) to get the total pricing picture. 8. What are the special skills and experience that you possess? Measure the vendor’s breadth and depth of experience in offering the services that you require. Get to know details about the provider’s past by asking if they have always been providing a particular service or if they evolved into providing a service. Ask them for intricate details about their competencies, strengths, experience and skills. 9. Will you be flexible enough to accommodate my specific needs? Asses if the vendor is simply trying to sell you their services by over promising or if they are genuinely committed to tailoring their services to meet your unique needs. You can know for sure by asking the provider’s existing customers if their needs were accommodated. Check if the service provider demonstrates a willingness to clarify your needs and map these onto their service offerings. However, you should not expect the vendor to reinvent their business model for you. 10. How strong is your financial health? Do not overlook the financial health of a prospective vendor as this is very critical. If the prospective provider is a brand new start–up or less than two years old, you must ask to review their cash flow position, burn rate and other financial information to mitigate the risk of losing a business partner due to sudden financial death. It is always safer to outsource to an established service provider with a track record of profitability. 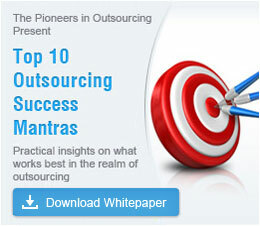 India, the outsourcing capital of the world, has some of the world’s best service providers. One such provider is Outsource2india. With a proven track record of over 20 years, thousands of satisfied customers and experienced management personnel, Outsource2india is the perfect vendor for your business. Contact us to get started on outsourcing. Check country's political environment, data security measures, currency rate & government support before offshoring. Valuable tips to help you get your message across and make the right choice.